Owners and repository admins can remove an outside collaborator's access to a repository. While forks of private repositories are deleted when a collaborator is removed, the person will still retain any local clones of your repository. Under the "People" tab, click Outside collaborators. Select the outside collaborator or outside collaborators you'd like to remove from the organization. 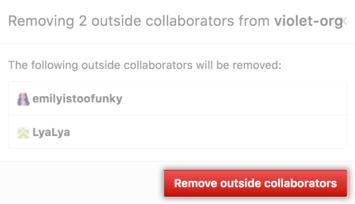 Above the list of outside collaborators, use the drop-down menu, and click Remove from all repositories. Review the outside collaborator or outside collaborators who will be removed from the organization, then click Remove outside collaborators. If you only want to remove an outside collaborator from certain repositories in your organization, you can remove this person's access to one specific repository at a time. 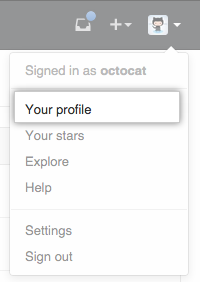 To the right of the username of the person you want to remove, use the drop-down menu, and click Manage. To the right of the repository that you want to remove the outside collaborator from, click Manage access. To completely remove the outside collaborator's access to the repository, in the upper right corner, click Remove access to this repository. To confirm, click Remove access. "Converting an organization member to an outside collaborator"